He is destroying that chair. Dismantling it. Tearing it limb from limb. He begins with the legs, which, each in turn, he flexes and twists, first weakening then snapping the tubular metal. Discarding these, he moves on to the base, using strong hands to prise it apart from the goose-pimpled plastic seat. More flexing and twisting, and soon the base itself is in fragments. Now the seat, a single piece of moulded red plastic. Using his foot as a fulcrum, he levers the plastic backwards and forwards, until a white seam appears along its concave middle. Then he sets about trying to tear along that weakened seam. A more difficult task than he had assumed, but he makes headway, slowly. He performs the entire procedure with an air of bored focus. I watch from across the room, bemused at the senseless destruction of that innocent chair. I don't use the word gospel lightly. Here was a secular film that extrapolated, in teenagers' language, the notion of 'love thy neighbour'. Love is understanding difference, recognising shared humanity, accepting others and treating them well. It sees through cliques and types. 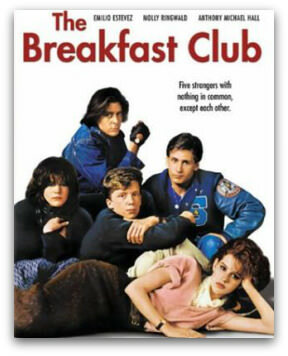 A simple device for this contemporary parable: five teens of varying types — a 'jock' (Emilio Estevez), a 'prom queen' (Molly Ringwald), a 'geek' (Anthony Michael Hall), a 'freak' (Ally Sheedy) and a 'thug' (Judd Nelson) — are forced to spend a Saturday together in detention. Each has environmental and personal reasons for being who they are. A combination of nature and nurture, compounded by the eternal adolescent quest for individualisation, and the converse but equally powerful forces of peer pressure and social and familial expectations. They're all alike, though ostensibly so different. At the start of the film, the differences lead to tensions. As the film progresses, and following a few cathartic hi-jinks and head-ons, they learn empathy. No matter what your clique, it's never easy being 'you'. But these equivocations were subsumed by appreciation for the characters' sometimes shocking lessons in empathy. Most powerful is a monologue by the 'thug', John Bender, where he play-acts his drunken father first berating, then physically abusing him. Even tough guys hurt sometimes. A lesson learned, but easier in theory than in practice. If we're speaking about types, then the chair-mangler was our 'John Bender'. I never spoke to him. Not once in the two years we were at the same school. In truth I was scared of him. My type wasn't supposed to mingle with his type. It's hard to 'love your neighbour' when you're a teenager, and it feels like it's you against the world. It's hard as an adult too, although hopefully retrospect feeds wisdom. No doubt the chair-mangler had his own struggles in trying to be the best person he could be; perhaps he wrestled with them, as he wrestled that chair to bits. It's worth remembering, whenever someone sleights you, that they too may have their own chairs to mangle. I must admit I sometimes wonder what the chair-mangler is doing with his life today. And I think of The Breakfast Club, and how I can best live out the gospel according to John Hughes. American filmmaker John Hughes died of a heart attack last week, aged 59. Beautifully evoked - if you can't remember high school's awkward fears & loves you may be repressing, denying or underestimating the formative influences. Or you have no pulse. What a beautifully crafted piece Tim. The Breakfast Club is indeed a classic, and John Hughes' films were a big part of my own high school years. There's a bit of Bender in all of us. Economists are often, sometimes spectacularly, wrong. But like all prophets, they are unabashed by and unpunished for abject failures. They pop up from each new set of ruins, surprised yet unrepentant, princes of a plethora of evanescent predictions. On a streaming easy line, kilometers of small creatures' terror terrain beneath the reigning kyrios of ripped earth.